When it comes to public advocacy this year, one of the most effective announcements came in December. The NSW Health Care Complaints Commission issued a public warning under s94A of the Health Care Complaints Act 1993 with regard to the “misleading and unsafe practices by anti-vaccination campaigners”. The HCCC had received numerous complaints about individuals and associations and is concerned about the risk they pose to public health and safety. have the potential to engender fear and alarm in the community, often targeting vulnerable members of the community through misinformation which may have a detrimental effect on the health care decisions of individuals. The NSW Health Care Complaints Commission (“the Commission”) has received multiple complaints regarding misleading and unsafe practices by anti-vaccination (“anti-vax”) campaigners and the potential risks that such persons and associations pose to the public health and safety. Immunisation is a simple, safe and effective way of protecting people against harmful diseases before they come into contact with them. Immunisation protects individuals and the community by reducing the spread of preventable diseases. Complaints have been received in relation to individuals (including registered and unregistered health practitioners as well as academics) and organisations engaged in the widespread promotion of dangerous anti-vax messages. Why is this warning being issued? Misleading and inaccurate information communicated by anti-vax campaigners has the potential to engender fear and alarm in the community and result in fewer people being vaccinated. This information commonly quotes scientific research and studies in support of anti-vax claims, but is often selective, including exaggerating the risks and minimising or discrediting the benefits of vaccines. The research presented does not align with the true evidence-base on which independent and government bodies worldwide make vaccination recommendations. This is likely to have a detrimental effect on the health care decisions of individuals and may lead them to make decisions not to vaccinate which pose an avoidable risk to their own health and to the safety of the wider community. It is unfortunate that anti-vax campaigners are also known to target particularly vulnerable members of the community, including impressionable young parents who are concerned about making the right health decisions for their infants. The spread of misleading and false information by anti-vax campaigners presents an ongoing challenge for government agencies, particularly due to the rise in use of social media and the proliferation of information concerning vaccinations available via the internet. Given the continuing efforts of anti-vax campaigners to mislead and misinform members of the public, the Commission considers it necessary to warn all health consumers of the danger of relying on information that is not from a reliable and trusted source. This can include websites that appear to be “professional” and groups that are well-organised in their approach. Some persons and associations will go as far as to distance themselves from “anti-vax” campaigners, while essentially promoting the same message. What should consumers do to protect themselves? The Commission strongly urges consumers to exercise caution in relying on information concerning the safety and efficacy of vaccinations which is promoted via social media and websites that are not government affiliated or endorsed. Further, consumers should be cautious of persons or groups spreading anti-vax messages via other means, including face-to-face information sessions and other public events. In all cases the following factors should be considered by consumers when presented with any information or advice concerning the safety and efficacy of vaccines and immunisation programs in Australia.To ensure that you are receiving reliable information concerning the safety and efficacy of vaccinations and to assist you in making an informed decision concerning the benefits and risks of particular vaccines, it is recommended that you consult a registered medical practitioner (e.g. your family GP or paediatrician). Health consumers should be particularly wary of persons claiming to be “experts” or to have conducted “research” into the safety and efficacy of vaccines or immunisation programs in circumstances where they do not hold relevant medical qualifications and are not a registered health practitioner. Health professionals play a role in health education and administration of vaccines, however it is not appropriate for health professionals to promote anti-vax messages via their personal social media pages or other online forums. Consumers should avoid placing any reliance on “comments” made via social media that are not from a reliable and trusted source. The Health Care Complaints Commission (“the Commission”) has issued a public warning under s94A of the Health Care Complaints Act 1993 regarding Misleading and Unsafe Practices by Anti-Vaccination Campaigners. The Commission is concerned about a number of complaints it continues to receive regarding misleading and unsafe practices by anti-vaccination (“anti-vax”) campaigners and the potential risks that such persons and associations pose to the public health and safety. Anti-vax messages have the potential to engender fear and alarm in the community, often targeting vulnerable members of the community through misinformation which may have a detrimental effect on the health care decisions of individuals. Anti-vax campaigners will often selectively quote scientific research and studies in support of anti-vax claims, including exaggerating the risks and minimising or discrediting the benefits of vaccines. The research presented does not align with the evidence-base on which independent and government bodies worldwide make recommendations. on information that is not from a reliable and trusted source. This can include websites that appear to be “professional” and groups that are well-organised in their approach that often use popular mechanisms like social media to promote their messages. Visit trusted government websites when researching online, including the NSW Health and Commonwealth Department of Health websites and the National Centre for Immunisation Surveillance and Research (NCIRS) website. Recently the Australian government announced that from April 2019 the meningococcal vaccine Nimenrix will be available free to teenagers aged 14-19. This will prove to be a significant public health measure against Invasive Meningococcal Disease (IMD). Nimenrix is a quadrivalent vaccine protecting against 4 of the 13 serogroups of the bacterium Neisseria meningitidis. The four serogroups are A, C, W and Y. The vaccine Bexsero protects against serogroup B and is presently the subject of a South Australian study. The manufacturers of the vaccine, GlaxoSmithKline have confirmed they will seek to have Bexsero listed on the National Immunisation Program once they have the study results. The ACWY vaccine has been freely available to 12 month olds since July 1st, 2018. Of these five primary strains of meningococcal disease, B and W serogroups are the most common. The incidence of meningococcal disease and the serogroup responsible fluctuates over time. According to the National Centre for Immunisation Research and Surveillance (NCIRS), serogroup B (MenB) was the most common cause of IMD from 2006 to 2015. Over this period MenB accounted for 63% to 88% of annual notified cases where a serogroup was identified. An NCIRS fact sheet notes that since 2013 serogroup W (MenW) has increasingly caused IMD. In that year 17.4% or 17 cases with an identified serogroup were responsible for the disease. By 2017 MenW was identified as responsible for 38.1% or 139 cases. It is also clinically interesting that the NCIRS have reported, “many of the MenW cases have been due to a single clone of meningococcus, the ST-11 strain type”. This suggests sustained person to person transmission. MenW appears to have a higher fatality rate (9.3%) than MenB (5%). With serogroup Y there has been a “smaller but notable” increase. In 2014 there were 7.4% or 12 cases of those with an identified serogroup, increasing to 20.5% or 75 cases in 2017. IMD due to serogroup Y is more common in older Australians. 61% of the 75 notified cases in 2017 were in adults ≥ 45 years or older. The decrease in cases due to serogroup C (MenC) is an indication of the efficacy of immunisation programmes. The MenC conjugate vaccination programme began in 2003. The number of MenC cases with an identified serogroup was 225 in 2002, falling to 14 (3.8%) in 2017. The NCIRS observe that, “serogroup A disease remains rare in Australia”. Nonetheless overall meningococcal disease and death from different serogroups has increased in recent years. Reporting recently on the government intention to soon provide the quadrivalent Nimenrix vaccine to teens, both SBS and Fairfax published the following figures on IMD for 2015 – 2017. Laboratory tests have confirmed meningococcal disease as the cause of death in a 25 year old woman in the New England region. The young woman collapsed at home on Saturday, September 22 and was taken to hospital by ambulance, but was unable to be revived. Meningococcal disease can kill within 24 hours if not treated in time. The audio below is from Meningococcal Australia and addresses important points regarding infection, symptoms, prevention and treatment. 10% of those infected will die, and around 20% will have permanent disabilities — ranging from learning difficulties, sight and hearing problems, to liver and kidney failure, loss of fingers, toes and limbs and scarring caused by skin grafts. It is important to access reputable information with respect to diseases such as Invasive Meningococcal Disease. IMD from the five primary serogroups A, C, W, Y and B can be prevented by vaccination. This makes it a target for misinformation from the anti-vaccination lobby. In Australia the most vocal group is the Australian Vaccination-risks Network, or AVN. Meningococcal bacteria can live harmlessly in the throat and nose in 20% of people and IMD is one of the less common bacterial diseases. Antivaccinationists use this information to wrongly assert there is no need to be vaccinated. Yet the reality is that in cases of meningococcal disease the bacteria enter the bloodstream and multiply rapidly, causing septicaemia and damage to blood vessel walls. This leads to bleeding into skin tissue producing the dark purple rash associated with meningococcal disease. Bacterial meningitis caused by meningococcal disease is the most dangerous type of meningitis. Meningitis is a serious inflammation of the meninges – the lining of the spinal cord and brain. Thus the argument that humans “naturally” carry meningococcal bacteria and should avoid vaccination is based on deceptive reasoning and is dangerously misleading. Vaccines are demonstrably very safe. The testing of vaccines before approval for use in Australia can take over a decade. Their ingredients are well understood and are themselves tested for safety. The introduction of the quadrivalent meningococcal vaccine Nimenrix is a positive for Australian public health. Recently the Australian Vaccination-skeptics Network emailed members to announce their change of name to Australian Vaccination-risks Network. The author of the email took the opportunity to falsely attack Australian Skeptics Inc., thoroughly misrepresent the global Skeptics movement and reinforce baseless fears about the risk benefit ratio of vaccines. 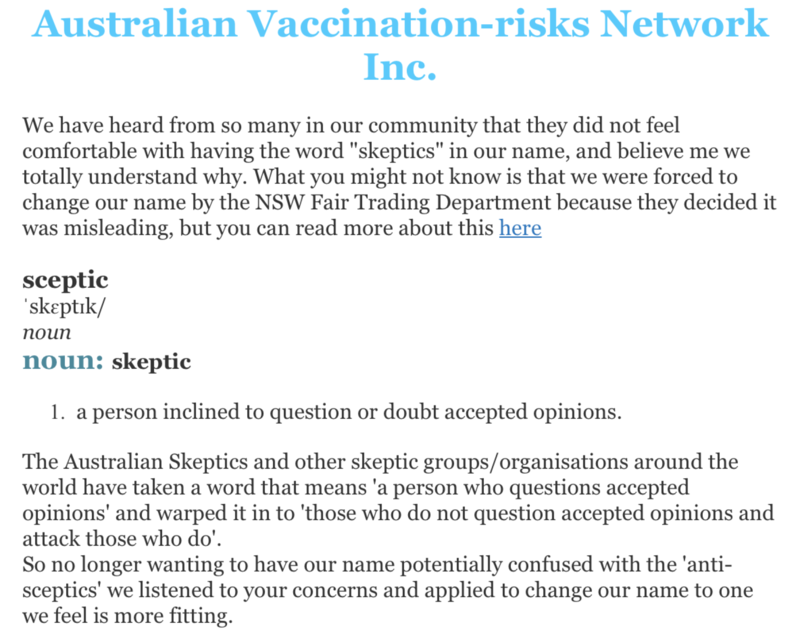 The email also misrepresented the circumstances via which the Australian Vaccination Network came to have the word “skeptics” inserted into it’s name. As will become clear below the word “risks” could have been chosen by this anti-vaccine group four to five years ago. 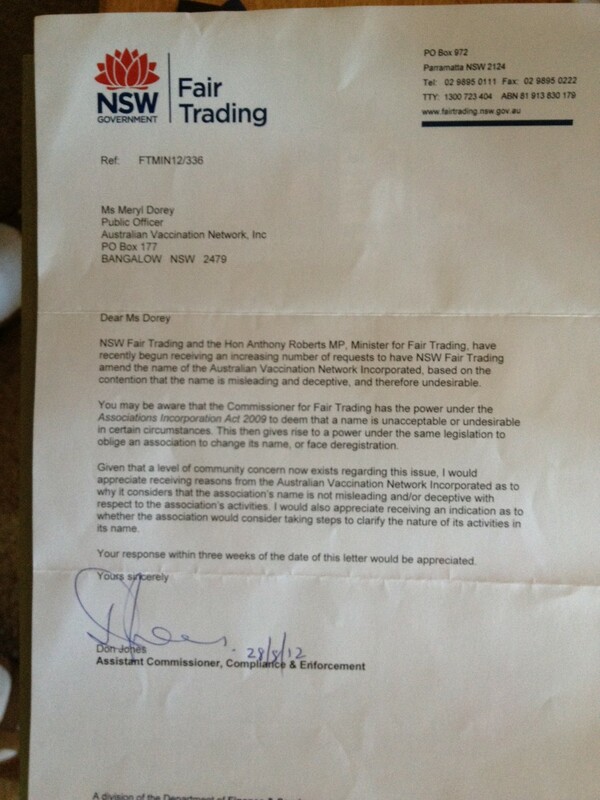 …an increasing number of requests to have NSW Fair Trading amend the name of the Australian Vaccination Network Inc., based on the contention that the name is misleading and deceptive, and therefore undesirable. The full letter dated August 28th, 2012 is below. Is there a direct line of communication between the Australian Skeptics, Stop the AVN (SAVN) and government departments? Which brings us back to the groups’ most recent email, the very tiring attacks on skeptics and the even more tiring contention that Australian Skeptics Inc. is linked to Stop The AVN. It’s worth noting that because of confusion with the official sounding Australian Vaccination Network, the volunteer citizens group Stop The Australian Vaccination Network had prior to the time of NSW Department of Fair Trading involvement changed their name to Stop The Australian (Anti) Vaccination Network. It seems quite clear the connotation of the email is that NSW Fair Trading “forced” the AVN to adopt the noun skeptics as part of their name. Worse the noun skeptic is purposefully misrepresented in the context in which it is used, which leads to such ridiculous name calling as “anti-skeptics”. Let’s examine the misrepresentation of a very basic definition of the word “skeptic” with the term as it is understood by the Skeptic movement first. Then by examining the evidence that Ms. Dorey discarded the option of “risks” to instead choose “skeptics” after losing an appeal against NSW Department of Fair Trading, we will appreciate the deceptive argument that is laid out. The noun cited above is a very basic, indeed rather limited understanding of the term. In fact by citing this and then immediately referring to the global skeptic movement Ms. Dorey (whom I have little doubt wrote this unsigned email) confirms she is ignorant of the difference between a skeptic and the Skeptic movement. She has completely ignored the importance of evidence and scientific consensus to the Skeptic movement. Her view of a skeptic as used to attack genuine scientific skeptics would seem to be someone who doubts reality. 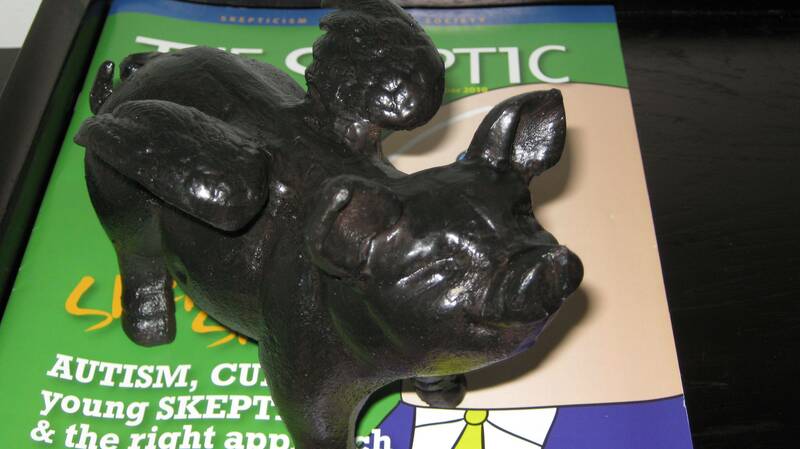 I have written about this childish abuse of science and philosophy in addressing her blog The Real Australian Sceptics. At that time – May 2012 – Dorey used the exact same definition of the noun “skeptic” as in the email above. The article examines why Dorey and the AVN are in fact pseudo-skeptics, despite her antagonistic habit of using that term to describe skeptics who request she prevent current, reproducible, peer reviewed evidence. I imagine the inventive ‘those who do not question accepted opinions and attack those who do’, may well reflect the anti-SAVN work of Brian Martin who was initially contacted and misled about apparent attacks, by Ms. Dorey herself. He then published a number of extremely biased pieces, which laden with conspiracy theory, appear to repeat the same conclusion from various angles. Namely that the SAVN and skeptics have bullied and attacked Ms. Dorey. Yet there is absolutely no mention of Dorey producing convincing evidence. The Skeptical Movement page hosted at Wikipedia has far more suitable definitions under Scientific Skepticism. Note the importance of evidence as opposed to opinion and ideology. What skeptical thinking boils down to is the means to construct, and to understand, a reasoned argument and, especially important, to recognize a fallacious or fraudulent argument. The question is not whether we like the conclusion that emerges out of a train of reasoning, but whether the conclusion follows from the premises or starting point and whether that premise is true. Science is […] a way of skeptically interrogating the universe with a fine understanding of human fallibility. If we are not able to ask skeptical questions, to interrogate those who tell us that something is true, to be skeptical of those in authority, then we’re up for grabs for the next charlatan, political or religious, who comes ambling along. A skeptic is one who prefers beliefs and conclusions that are reliable and valid to ones that are comforting or convenient, and therefore rigorously and openly applies the methods of science and reason to all empirical claims, especially their own. A skeptic provisionally proportions acceptance of any claim to valid logic and a fair and thorough assessment of available evidence, and studies the pitfalls of human reason and the mechanisms of deception so as to avoid being deceived by others or themselves. Skepticism values method over any particular conclusion. The Australian Vaccination Network has no intention of changing its name and any group or government department that believes it has the right to try and force us to do so will find themselves strenuously opposed. The AVN lost the appeal [ABC]. The full Administrative Decisions Tribunal finding can be found here. 1) The Australian Vaccination Network Inc (AVN) has been directed to change its name. The main reason the Director General of the Department of Finance and Services gave for making that direction was that the name is likely to mislead the public in relation to the nature, objects or functions of AVN. The Director General found that AVN’s message is anti-vaccination and that the name does not reflect that message. Two other reasons the Director General relied on were that the name is “undesirable” and that it suggests a connection with the Commonwealth government. 2) AVN applied to the Tribunal for a review of that decision. I have decided that the decision to direct AVN to adopt a new name is the correct and preferable decision. But my conclusion is not based on a finding that AVN’s message is exclusively anti-vaccination, that the name suggests a connection with the Commonwealth government or that the name itself is undesirable. 3) AVN’s main object is the dissemination of information and opinions that highlight the risks of vaccinations. AVN is sceptical about vaccinations. The existing name, Australian Vaccination Network Inc, suggests that the association is pro vaccination or, at least, is committed to providing comprehensive information and opinions about the pros and cons of vaccination. The name should be changed so that it is not likely to mislead the public in relation to its main object. 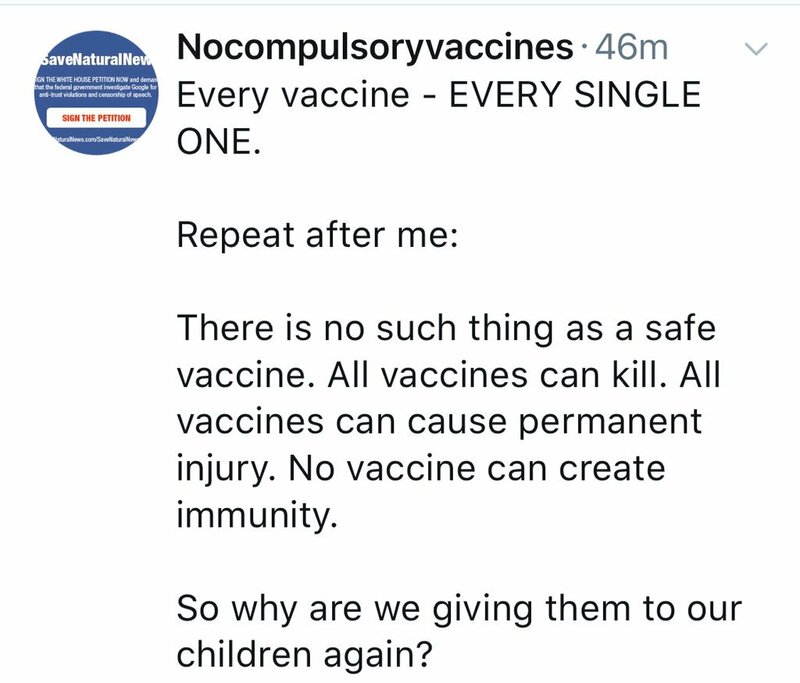 Although I do not have to decide this issue, a name that includes the word “risk” or “sceptic” such as Vaccination Risk Awareness Association Inc or Vaccination Sceptics Network Inc would, in my opinion, be acceptable. The name could also include the word “Australia” or “Australian” without suggesting a link to government. Still the choice made by Ms. Dorey and others was the word “skeptics”. They were not forced to use the term. Far from not wanting to be associated with the Skeptic movement it is more likely, given the online attacks by the AVN toward skeptics, that they enjoyed insisting that a true skeptic doubted everything. Their mistake of course is that members of the Skeptic movement are far more interested in seeking evidence and actively exposing charlatans, fraudsters and those who care little for discarding ideology in place of evidence. Nonetheless there we have it. One simple email and once again members have been lied to. Unfortunately the group will continue to mislead the same members and readers about the risks of vaccines, which are very minor indeed. Recently the Australian Vaccination skeptics Network (AVN) announced via email that it intends to run a “Sacrificial Virgins tour” from QLD to Victoria. This, we are told, follows on “from the incredible success of last year’s tour of VaxXed; from coverup to catastrophe“. Vaxxed has been comprehensively debunked, fraudulent tricks such as the manipulation of the so-called “whistleblowers” phone call audio exposed and the far reaching dishonesty of conspiracy theorists who promoted that venture is clear. It appears we can expect the same once again with another fraudumentary from the creative folk at SaneVax and UK Association of HPV Vaccine Injured Daughters – Sacrificial Virgins: Not For The Greater Good. Whilst this conclusion can be drawn from researching reputable source material and understanding the AVN’s misuse of the USA’s Vaccine Adverse Event Reporting System (VAERS), Australians have a unique means by which to judge the AVN. it is an experimental vaccine with no proven record of safety or effectiveness. since its use, extensive worldwide data on its safety and efficacy has been collected supporting its safety. AVN uses data from the United States Vaccine Adverse Event Reporting System (VAERS) on its website, without qualifying that no cause-and-effect relationship has been established. 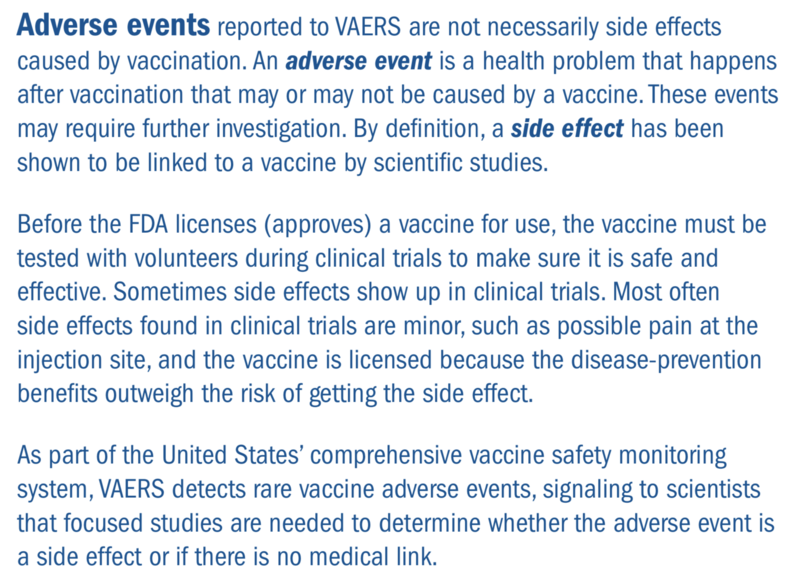 This is because VAERS collects data on any adverse event following vaccination and it is specifically stated that any report of an adverse event to VAERS is not a causal link that a vaccine caused the event. By running a “tour” the AVN also stand to make a profit. Rather than inform members and followers that they could watch the film for free on YouTube, the AVN will charge $25.00 per head and follow up with a Q&A session. Meryl Dorey is the founder, past president, spokesperson and ever-present driving force of the AVN. Her anti-vaccination fervor and singular ability to deny the scientific consensus that upholds evidence based medicine has persisted for decades. These qualities are matched only by her focus on making money from an unsuspecting public. If one cannot attend any of the seven screenings of Sacrificial Virgins, “(or even if you can), you can also help with a sponsorship – no matter how small – to assist the AVN in providing these sorts of high-quality events into the future.” More to the point any gathering of similar minds encourages attendees to spend. 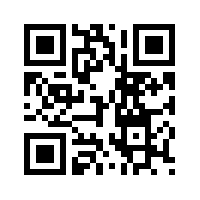 In this case to purchase anti-vaccine material and possibly AVN membership. Although the AVN, and particularly Meryl, insist they/she are/is not anti-vaccine. Could the video be anti-vaccine? No. This documentary presents information from scientific experts about known risks of this medical procedure. It simply suggests that in order to make a vaccination choice, all available information should be made available to parents and those considering taking the HPV vaccine. Which brings us back to the source of their information. The reason you haven’t heard of these “sacrifices”? In an AVN email yesterday promoting today’s “vaccination conference”, The Censorship of the Vaccination Debate in Australia Today unverified contentions in the form of questions were included. Why can’t we talk about vaccines? Why are the media, pharmaceutical companies and industry lobby groups dictating government vaccination policies? More importantly can mandatory vaccination policies actually protect our health? Brian Martin, Emeritus Professor, University of Wollongong. Founder of ‘The Australian Vaccination Skeptics Network,’ 1994. 2019 will be the year of the seminar so your help today will ensure that we are able to bring this message to as many locations in our huge country as we possibly can. Unintended adverse reactions have blighted and even ended the lives of girls, young women, men and boys around the world. Despite this fact, pharmaceutical manufacturers and many health authorities have refused to acknowledge there is a problem and the medical community continues to aggressively market this vaccine. We must ask, where do these agents of deception get off rocking the stones to so casually pin together this many lies about one of the world’s safest vaccines? Many will parrot the nonsense spread by identities such as the six above who erroneously believe vaccine policy discussion is censored. Yet consider the example below, which in various forms, has for so many years fed the notion that VAERS provides the truth that mass vaccination is “a problem”. This “problem” is created in part from the abuse of self reported adverse reactions to VAERS and non-established side effects. More so, serious conditions, including death, that have not been established as side effects are misrepresented in a quantifiable sense. For example the unverified claim that Chronic Regional Pain Syndrome (CRPS) is triggered by the HPV vaccine, may be followed by a verified claim that side effects occur in “four out of five HPV vaccinations”. Without proper explanation a casual reader may conclude that 80% of HPV recipients go on to develop a serious, disabling, chronically painful neurological condition. Similarly unverified claims may be made for Premature Ovarian Failure (POF), and/or Postural Orthostatic Tachycardia Syndrome (POTS). All medicines, including vaccines, can have side effects. The reactions people have had after the HPV vaccine have been similar to reactions after other vaccines. The most common side effects of vaccination are pain, redness and/or swelling at the site of injection. These symptoms occur after around 4 in 5 vaccinations but are temporary and show that the immune system is responding to the vaccination. These symptoms can be treated with a cold pack or paracetamol if needed. Side effects such as anaphylactic reaction are very rare occurring at around three per one million vaccinations. VAERS scientists look for unusually high numbers of reports of an adverse event after a particular vaccine or a new pattern of adverse events. If scientists see either of these situations, focused studies in other systems are done to determine if the adverse event is or is not a side effect of the vaccine. Information from VAERS and vaccine safety studies is shared with the public. Throughout the process of monitoring VAERS, conducting studies, and sharing findings, appropriate actions are taken to protect the public’s health. For example, if VAERS identifies a mild adverse event that is verified as a side effect in a focused study, this information is reviewed by CDC, FDA, and vaccine policy makers. In this situation, the vaccine may continue to be recommended if the disease-prevention benefits from vaccination outweigh the risks of a newly found side effect. Information about newly found side effects is added to the vaccine’s package insert that lists safety information. Newly found side effects also are added to the Vaccine Information Statement (VIS) for that vaccine. If serious side effects are found, and if the risks of the vaccine side effect outweigh the benefits, the recommendation to use the vaccine is withdrawn. Also included is a succinct explanation of how an adverse event becomes a side effect. What is crucial, and constantly ignored by the anti-vaccine lobby, is that adverse events may or may not be caused by a vaccine. Significant follow up, research and investigation is needed before the event can be coupled to a vaccine in the form of a side effect. Australia’s Therapeutic Goods Administration has a thorough explanation for visitors to the Database of Adverse Event Notifications. Anyone who’s followed the antivaccine movement can guess immediately which vaccine this is about, namely the HPV vaccine, which is administered to preadolescent girls. That age is chosen because it is before the vast majority of girls become sexually active, and HPV is primarily a sexually transmitted disease. So the best time to achieve immunity is before girls (and, according to the latest recommendations, boys too) become sexually active. The term “virgin” is clearly designed to play on this timing. If a woman is immune to the proper serotypes of HPV before she becomes sexually active, then the cervical cancer caused by those serotypes can be prevented. That’s how HPV vaccines work, and they are very effective. Officials report that there have been 17,500 or more “adverse” incident reports that have been made over the last few years because of the use of the vaccination. Actually anyone can report adverse incidents and whilst VAERS is the official reporting system, until extensive trends and further research establishes a side effect linked to a HPV vaccine, Fiala’s claim is simply meaningless. Originally released as a method for preventing cervical cancer in women, its use has since been expanded to include young men and boys despite the fact that its effectiveness as a cancer preventative is medically unproven. Others have noted this pointless argument as disingenuous, and I’d agree. Not enough time has passed for those initially vaccinated with the HPV vaccines for valuable data to be gathered on changes in cervical cancer epidemiology. Still, it makes a nice straw man if your goal is to convince others that the real aim is to make money and the only demonstrable action is many thousands of adverse reactions. I’d also recommend reading Gardasil facts – debunking myths about HPV vaccine safety and efficacy, by Skeptical Raptor for further insight into the vaccine’s efficacy. Doctors are hailing the development of a new vaccine as an important victory in the fight to protect women against cervical cancer. The vaccine is an improved version of Gardasil, which already protects women against some strains of HPV, the virus that can cause the cancer. The new formula of the jab has been shown to prevent 93 per cent of HPV strains. Professor Garland said the other benefit of the new vaccine is that it only requires two, instead of three doses. The new 9vHPV vaccine, available in Australia since early 2018, protects against all the 4vHPV types plus an additional five high-risk HPV types, 31, 33, 45, 52 and 58. It is well worth reading through the NCIRS FAQ document. It covers a large amount of relevant information and already covers many of the deceptive themes that are found in Sacrificial Virgins. How do we know HPV vaccines are safe? Clinical trials have shown that the 9vHPV vaccine is safe and there are no significant concerns regarding its safety in Australia. Studies have showed that the 9vHPV vaccine has a similar safety profile to that of the 4vHPV vaccine and that it is generally well tolerated in adolescent girls and boys as well as women and men. The document goes on to address whether the vaccine causes autoimmune disease (No), cancer (No), fainting, CRPS (No), POTS (No), POF (No) or infertility (No). It is not a genetically modified vaccine. Questions include whether Gardasil addresses enough strains of HPV, or as cervical cancer is rare, whether it is necessary at all. Data specific to the importance of HPV vaccination in Australia is very promising. Can we trust vaccine trials sponsored by manufacturers? Why is their information claiming the vaccine is dangerous, if it isn’t? And so on. No doubt Sacrificial Virgins will prove somewhat interesting. The difficulty for antivaccinationists is that the evidence refuting their claims is available in abundance. More so it continues to grow pushing the chorus against the HPV vaccine further into the realm of conspiracy theory. In early August last year the Australian Vaccination-skeptics Network held one of many Australian screenings of the fraudulent, debunked anti-vaccine film Vaxxed at Hawthorn town hall in Melbourne Victoria. The director of this nonsense is disgraced former gastroenterologist and persistent enemy of public vaccination, Andrew Wakefield. At this event the AVN hosted a rogue Melbourne GP who, using bogus claims, was helping parents circumvent No Jab No Play legislation. With video of the GP published online, the outcome was immediate revelation of his identity. Three weeks later Dr. John Piesse faced suspension by the Australian Health Practitioner Regulation Agency (AHPRA). At that time it was reported he “vowed” to continue placing innocent children and the community at risk until he was indeed suspended. Not long after he agreed to stop practising while AHPRA investigated his conduct. A Melbourne doctor who has been under investigation for his anti-vaccination stance has had his licence to practise suspended. 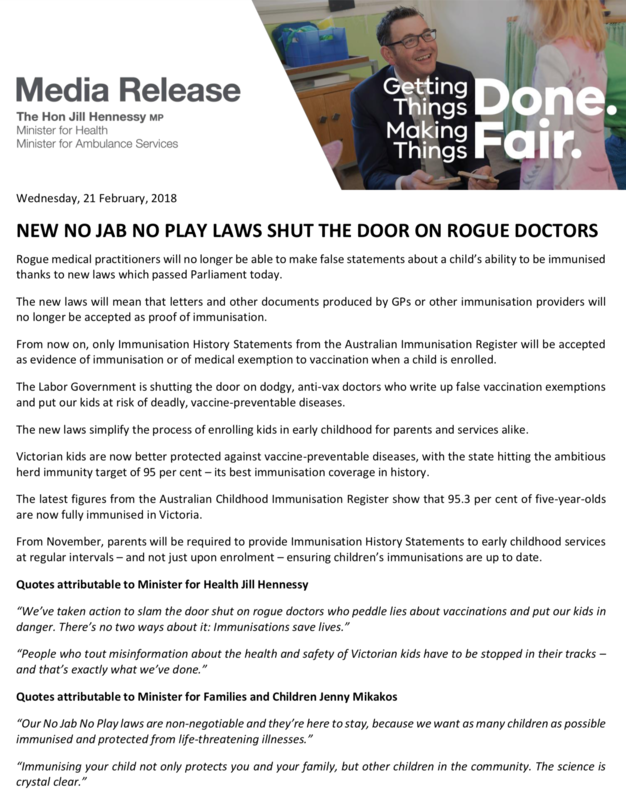 Dr John Piesse’s practice in Mitcham was raided by the Australian Health Practitioner Regulation Agency (AHPRA) and police officers last week following allegations he had helped families avoid compulsory childhood vaccinations. He had agreed to stop practising temporarily while AHPRA investigated the matter. But the Medical Board of Australia’s Immediate Action Committee met on Thursday and decided to suspend his registration while the investigation into his practice continued. An excellent and comprehensive summary of Dr. John Piesse may be found at Diluted Thinking. The damage done by the anti-vaccination lobby across the developed and developing world continues. Their lies cost lives and quality of life. In addition they promote angst for innocent parents and attack hard working advocates – who may be grieving parents themselves – with relish. It is now 20 years since Wakefield published his fraudulent paper in The Lancet contending a link between the MMR vaccine, bowel disease and autism. It was ultimately described by The Lancet’s editor-in-chief as “utterly false”. A 2004 investigation by Brian Deer of Britain’s Sunday Times uncovered enormous financial conflicts of interest. Wakefield was exposed as a liar and fraud and struck off the UK medical register. Astonishingly three dozen charges were found proved. Almost all of his fellow authors withdrew their names and support from the fraudulent paper. With thunderous arrogance Wakefield “rejects” all of the findings against him. Years of research failed to reproduce or uncover phenomena similar to his claims. Wakefield continues to push his fraud from the USA, profiting now from the global Conspiracy Theory movement, destroying public health and what is left of his callous character as he goes. One understands Vaxxed is simply his most recent project. If and when more follow, as has been suggested, they too will be debunked. Recently BBC 4 produced an excellent review of the anti-vaccine movement titled, In the Wake of Wakefield (BBC). Twenty years ago, in February 1998, one of the most serious public health scandals of the 20th century was born, when researcher, Andrew Wakefield and his co-authors published a paper in the medical journal The Lancet.